Virtual reality headsets are nothing new now; they have been around for a couple of years. Unfortunately for all iPhone users, they will have to wait a few more years for a virtual reality headset completely paired with their iDevices, since the iGlasses are no closer to being launched yet, though Apple has been trying to perfect the technology for their gadgets for years. However, that does not mean that you cannot experience immersive adventures brought by VR. Thanks to various developers developing VR Apps, iPhone users can now get their fill of virtual reality. You do not have to wait for a headset that is only produced by Apple; there are several VR Headset for iPhone available on the market that work perfectly well with your iPhone as well. Whether it is the Google Cardboard headset or a more premium one like the Zeiss VR One, you can enjoy an immersive experience on your iPhone with the help of these headsets. 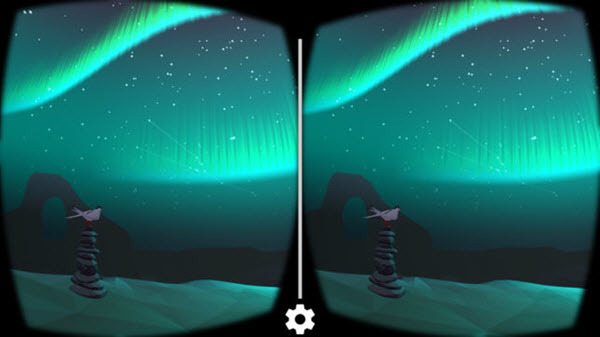 A VR headset is essential for using the VR apps on your iPhone, unless you do not mind just swiping left and right on your screen. There are several good VR Apps available in the App store to give you an amazing VR adventure. Here lists the top 5 VR Apps for your iPhone in 2019. If you have a VR headset and want to unlimit your experiences on iPhone, then YouTube is the next best target. With 360-degree videos becoming more and more popular, you can now know what it is like to be inside your favorite artists’ music video. Apart from that, there are a lot of exciting experiences for you with YouTube 360 degree video feature. As more and more people jump into this trend and create videos for 360-degree viewing, your options will go on increasing every day. Whenever you think of new and innovative technology, Google is never far behind. Along with its Google Cardboard Headset, Google has also developed a VR apps for iPhone users. This application guides you on how to set up your VR headset on iPhone, and it is completely free. The application offers five virtual reality experiences, which helps you get what you can expect. With the help of this application, you can ‘Explore’ places around the world virtually. In the mood to visit the Eiffel Tower? Well, now you can experience it on iPhone with your VR headset! Other than that you can as well view museums and exhibits, go for an urban hike and even relax under the beauty of the Northern Light by Arctic Journey. You can even immerse yourself in the beauty of a kaleidoscope with mind-boggling VR experience. When faced with new technology, people always think of innovative ways in which they could use it. This is precisely what NYT VR has done. They have approached the VR technology from a journalistic point of view and use it as a way of story telling. Instead of hearing news about some massive crises around the world, you can now experience it first-hand, and see what the situation really is . 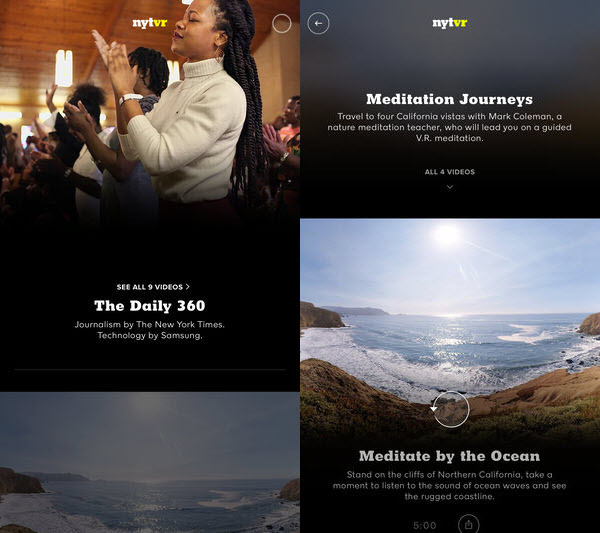 NYT VR app for iPhone focuses on producing videos about places that you may have heard of but cannot go to, and it is dedicated to record the lives of people around the world in places which may be rife with violence and injustice, though this application does not publish videos quite often. Instead of compromising on their quality and publishing videos that may not be so good, they invest their time to produce an exceptional video with the help of excellent technology. The world of news is about to experience a massive change if more people start adopting VR into their strategies. If you are a fan of the Discovery Channel, then this VR application is the winner for you. 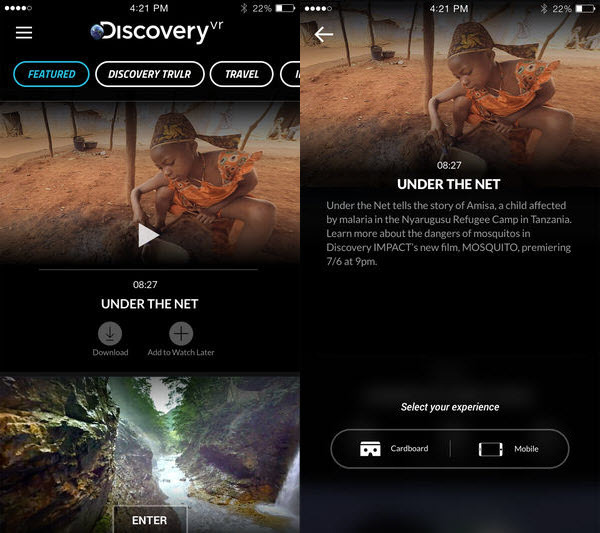 The Discovery VR offers many interesting VR experiences for iPhone, and of course, many episodes on Sharks. After all, it wouldn’t be the Discovery Channel if it didn’t have some quality shark videos. Apart from that you can explore other wonders of nature, and get a closer look at animals, without actually getting close. The Discovery VR app is excellent for all nature lovers and those who have a particular interest in it. 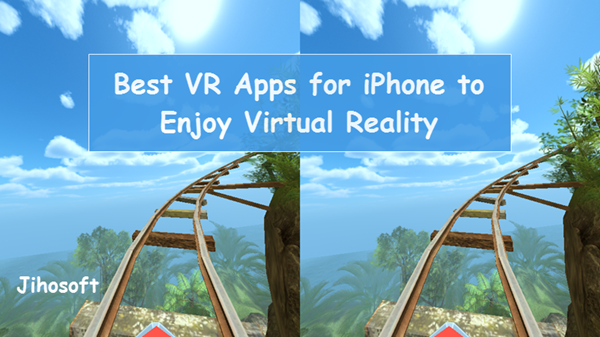 The VR Application is also completely free for iPhone. Jaunt VR offers VR experience from start to finish. It is a gateway to films, musicals, and documentaries that are shot using 360-degree cameras. The app allows you to enjoy an immersive experience in these masterpieces with the help of VR technology on iPhone. You can start by selecting a film from a room full of options, and then sit back and enjoy the show. The Jaunt VR offers you an entirely new way to enjoy movies and shows, and it is the perfect tool for entertainment. As the popularity of the app grows, so does its collection. Perhaps, soon, you will be able to be immersed in your favorite movie and feel as if you are in it right along with all the characters. Download: This app is not avalible on App Store any more. Tips: If you accidently deleted videos from iPhone, you can always use Jihosoft iPhone Data Recovery to get them back easily from iOS device or backup. Virtual Reality technology has undergone a few innovative changes over these years. People are continually trying to figure out more ways which they can explore in and benefit from. For now, when you use a VR headset, you genuinely feel like you are living in the future. From being able to view the Wonders of the world, to get to step around the moon, the virtual reality applications have soared to new heights. You can understand what it means to be truly immersed in something, and be able to get a taste of experiencing these interesting adventures firsthand. Although iPhone users are still waiting for a VR headset produced by Apple themselves, for now, they have a few excellent options to choose from and experience the fun on their iPhones in advance. The above-mentioned VR apps for iPhone are only able to give you a small glimpse of what the virtual technology world is slowly growing into in the future, but still look exciting.